What would I do without my raw milk, or as like to call it, white gold. Raw milk and the kefir I make with it are staples in my diet. Real raw milk from grass-fed cows is a complete food that you could live on exclusively if you had to. It contains proteins, carbohydrates, fats, vitamins, minerals, enzymes, cholesterol, and beneficial bacteria. Some of the amazing health benefits of raw milk include boosting the immune system, strengthening teeth and bones, and helping children grow up to be strong and healthy. It’s been shown to alleviate asthma and allergies, and help resolve digestive issues, arthritis, and osteoporosis among other things. Raw milk was actually used medicinally in the early 1900s. The Mayo Clinic administered the “Milk Cure,” which consisted of drinking 4-5 quarts of raw milk per day. This helped people heal from a variety of illnesses including chronic fatigue, cancer, weight loss, kidney disease, allergies, skin problems, urinary tract and prostate problems. These results are not seen on pasteurized milk. As someone who is active and athletic, I thought it was pretty cool that strength and conditioning coaches at the University of Michigan found chocolate milk to replenish muscles after an intense workout better than anything else. They probably weren’t using raw milk either. I have a glass of raw milk or a raw milk based smoothie after every workout. One more endorsement for raw milk are the Masai warriors of Africa who consume large quantities. They hunt lions, in packs, and one on one. Enough said. If you’re concerned about the safety of raw milk I’m here to put those concerns to rest. The number of overall milk borne illnesses is miniscule compared to other foods such as spinach and factory farmed beef, and new studies have confirmed raw milk is a low-risk food. If you’re going to consume raw milk know your source. Obviously an unsanitary farm is one to avoid. It’s actually sold in vending machines in several European countries. Allergic to milk or lactose intolerant? The latest figure I’ve seen was about 80% of people with milk allergies or lactose intolerance don’t have an issue with raw milk. If you don’t have access to raw milk simply substitute your preferred milk. Enjoy! 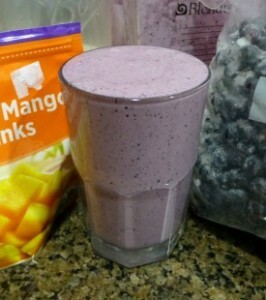 I’d love to know if you try this blueberry mango raw milk smoothie – please leave a comment below. Happy Blending! Today I’ve tried the strawberry spirulina and cacao smoothie… So delicious! Spirulina and cacao powder really work together! So I’m thinking about trying this one for tomorrow breakfast, with chocolate, mango and blueberry. For extra creaminess I use both greek yogurt and avocado. Do you think pear and blueberry is also a good match? Chocolate goes well in pretty much every smoothie, IMO. Avocado and Greek yogurt are excellent ways to thicken your smoothies! Yes, pear and blueberry pair well. Great to hear you’re digging these smoothie recipes. I tried using raw milk instead of water in my smoothie for the first time and I thought I discovered a secret ingredient because it was the best smoothie I ever tasted. That was my reaction the first time I used raw milk in a smoothie too.